Join us for a special evening of yoga practice and live harp music! 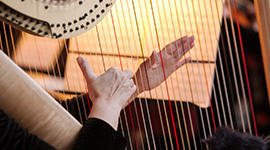 Instructor Lynn Batalden, DPT, will lead us through a series of asanas (yoga poses) as harpist Sofia Mattson plays us her music. Beginners are very welcome; poses can be modified to meet any concerns or limitations, as well as to challenge those with more experience.